2dr Coupe 8-cyl. 330cid/550hp DOHC Electronic Fuel Injection S/C Alum. Every once in a while a large company exhibits the flexibility and ingenuity necessary to successfully bring a low-volume niche car to market. The Dodge Viper is one example, and the Ford GT is another. The Ford GT was born during a wave of fresh thinking, rebirth, and retro-inspired nostalgia at Ford that saw several old nameplates reappear in their product line. In 2002, the GT40 concept car was shown at the North American International Auto Show with a look and a name that paid tribute to the company’s original GT40 race cars of four decades prior. By the end of 2004, production had begun on this mid-engined, 43-inch-tall supercar, which was now called the GT (the original GT40 nameplate was unavailable to Ford, as it was owned by Safir, who had built a run of GT40 continuation cars in the 1980s). 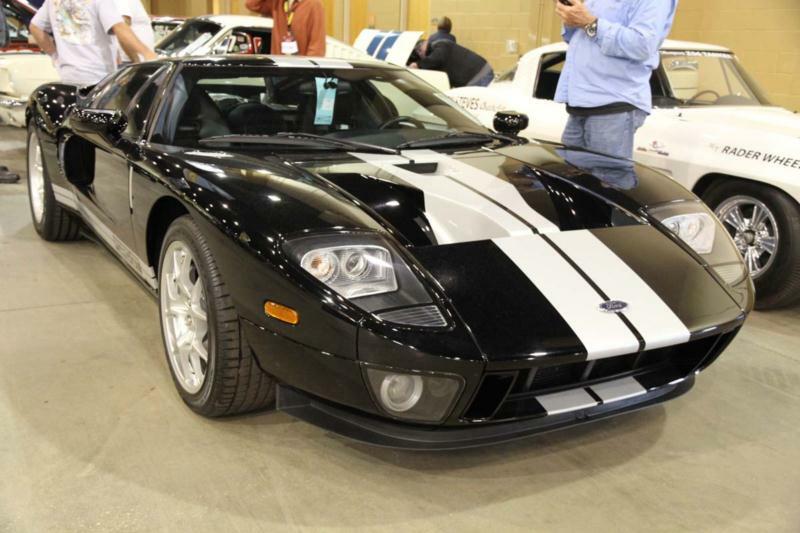 Production of each Ford GT involved multiple facilities with each car starting life in Ohio and being completed at Ford’s own SVT facility in Michigan. Just over 4,000 cars were built from 2004 to 2006. The two-seat Ford GT used a supercharged, 32-valve V-8 with 550 hp, which was mounted in a hydroformed aluminum and composite chassis that featured exotic suspension pieces and Brembo brakes at all four corners. Handling and braking were as impressive as the coupe’s 3.7-second 0-60 sprint and 200+ mph top speed. Positive reviews as well as favorable comparisons to the contemporary Ferrari 360/430 only fueled the frenzy for this car, and many sold well above MSRP, however dealers were discounting cars by the end of production in 2006. Four options were available on the GT, and these included Shelby-type racing stripes, forged BBS wheels, painted brake calipers, and an upgraded sound system. Most cars were equipped with all four of these options, and some 2006 cars had a Gulf Blue and Orange “Heritage” paint scheme that hearkened back to the GT40’s glory days at LeMans. Those in the market today for a Ford GT should be aware that some early production cars had issues with their electrical systems and suspension control arms, as well as engine main seal oil leaks. Throughout the production run, some cars also suffered axle bolt failures. Ford corrected all of this under warranty, so these well-publicized issues should not represent a current problem, although documentation for the warranty work can provide piece of mind. Today the Ford GT offers a breathtaking level of mid-engine performance, coupled with reliability that is difficult for some of its European contemporaries to match. For this reason, the Ford GT has found a home in a number of top-tier collections around the world, and is possibly the finest American car developed during the past 30 years. 8-cyl. 330cid/550hp DOHC Electronic Fuel Injection S/C Alum.